Bangkok (Thailand) – June 28, 2018 (travelindex.com) – Organized by Questex Hospitality Group, the Hotel Management Thailand Summit (HMT) 2018 has attracted international speakers and delegates to further discuss everything operational, commercial, and management in the hotel industry. HMT concluded on 7 June 2018 with over 160 participants in attendance at the JW Marriott Hotel Bangkok. This year, delegates heard from veteran hoteliers and subject matterexperts on thefollowing topics in a closed-door forum: Rethinking the Revenue growth Strategies in Competitive Environment; Technology Trends in Hospitality; Leveraging Dynamic Pricing Strategies to Combat Rate Imparity; Diversifying and Growing the Source Markets: Conqueringthe New Frontiers; Exploring the Latest F&B Trends amidst the Changing Fine & Casual Dining Scenes; Securing Owner Approval and Capital Investment for Renovations and Upgrades; and, a Hot Debate: How will Blockchain Technology Enable Distribution and Loyalty? Panelist Tracy Dong, Lead Advisor –Asia Pacific, IDeaS –A SAS Company in “Leveraging Dynamic Pricing Strategies to Combat Rate Imparity” says her two takeaways from her experience on stage are: Asset is not only the property value but the talents who make it a success; and, Technology is the future. Leveraging on the pricingcompetitive is advantageous to win the battle. HMT Summit 2018 is part of the Hotel Management Asia Summit Series, Asia’s only truly regional hotel management conference series. The series rotate through Bangkok, Hong Kong, Singapore, and Indonesia this year by leveraging regional experiences, insights, and innovations to address market-specific challenges. Questex Hospitality Group, the multimedia organization in the world dedicated to travel and lodging, drives revenue, productivity and value-creation for these related industries through strategic investment and deal-making forums, powerful lead-generation tools, interactive online business solutions, world-class events, and industry leading publications. Questex Hospitality Group also provides business development, marketing and training services to national tourism organizations, destination marketing associations, hotel, gaming, resort and cruise companies, online travel agencies, and travel advisors worldwide.Questex Hospitality is a division of Questex LLC, headquartered in Newton, Mass., with offices throughout the world. 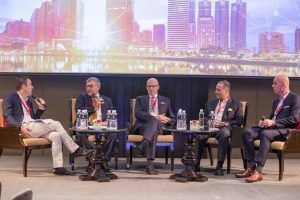 The leading conference in Thailand that directly addresses all operational/management challenges,the Hotel Management Thailand Summit provides a platform for hotel executives from both corporate level and property level to discuss key operational,branding and financial issues directly impacting corporate and property P&L. CEO, COO, CFO, VPs, GMs, Financial Controllers, and executive committee members will gather to strategize and debate on essential topics including brand equity, cash-flow management, cost control, innovation, and staff retention and development. Industry leaders will share their best practices and recommendations with their peers.